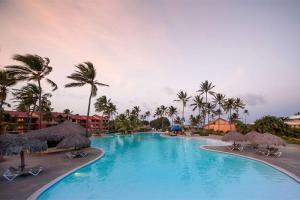 This all-suite resort boasts an excellent location alongside the pristine sands and clear blue waters of Bavaro Beach. The hotel offers 256 luxury suites and 14 romantic honeymoon suites with gorgeous views of the Punta Cana beaches. Guests can indulge in exquisite cuisine at any of the five restaurants. Located on the east coast of the island of the Dominican Republic in Bavaro Beach.